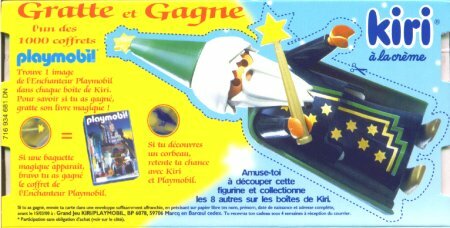 This playmobil® promo was found in the "french version" of the product, and lasted until March 15, 2000. 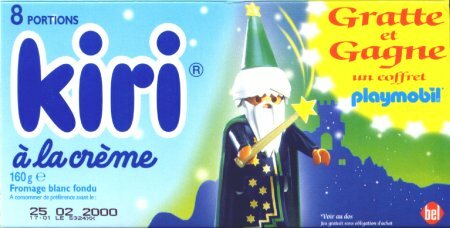 Each package has 8 pieces of very good white creamy cheese. During this promo (and the reason why it made it here) there was a card with an area to uncover. The card is shown on the right. 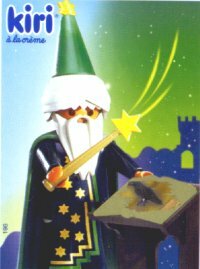 To win the Magician's Workshop (3839), we had to find the magician's magic wand in the book (and not the crow, like I did in all cards). From what it says in the package, there were nine different ones. The front (pictured above) was the same for all.